We begin this week’s MIS with news that’s sure to interest subscribers with iPhones, iPads or the iPod Touch. Why? Well, thanks to many, many hours of effort from MIS web site designer and maintainer Simon Roberts we are pleased to announce the release of the Madness Information Service app. How much will this set you back? Absolutely nothing. Not one penny. It’s absolutely 100% free! For those of you using Android devices we regret to say that a version for your OS isn’t currently in the works, but if the situation changes we’ll be sure to let you know. Now, on with this week’s issue. Enjoy the read! The charity fund raising evening “Suggs and Friends” makes a welcome return this coming March. The 2014 fundraiser takes place on March 20th at 6.30pm, with champagne reception and auction. The £150 donation tickets for pancreatic cancer gain entry to the Porchester Hall event in London W2. There’s no announcement yet as to who is joining Suggs at the exclusive event. Roger Daltrey has been added to the line-up of this evening. No further gigs or events at present. Keep an eye on http://deafschoolmusic.com for more information. No further gigs or events at present. A 4 track vinyl EP featuring Lee’s track from the first specialized album and tracks by the Valves, Rhoda Dakar and Nick Welsh. Should be in stock this coming week. Thanks go to Chuck Wren and Jump Up Records, Stan from A&R Texas (pressing plant), and Mike Schneider of Indigo Iguana (design). The Specialized Big One 2. Live DVD. For those wanting a copy of the DVD of the Big One 2 event we can reveal that you can now pre-order your copy. This will be limited edition and available into the new year. As is the normal spec with Specialized, all proceeds go to the Teenage Cancer Trust. Single release date mid February. Signed T-shirt packages and a deluxe edition. A range of Magic Brothers T-shirts, Polo Shirts are now available to buy. The CD album is available via Amazon and the download via iTunes contains an interview with Phil Jupitus talking to Woody about the album. But if you buy the album via the official band site you can choose a signed option or bundle. If you’ve a spare £75 and are really into the magic, then there are 25 packs going fast that include all of this…. The Magic Line Collectors Pack – Limited Edition of 25 includes; The Magic Line Signed CD Album. The Magic Line Digital Download. The Magic Line T Shirt. Woodys Drumsticks Signed. Nicks Guitar Paick Signed. Copy of Album Lyrics. “Thank You” Phone Call From Woody & Nick. Suggs is one of pop music’s most enduring and likeable figures. Written with the assured style and wit of a natural raconteur, this hugely entertaining and insightful autobiography takes you from his colourful early life on a North London council estate, through the heady early days of Punk and 2-Tone, to the eighties, where Madness became the biggest selling singles band of the decade. Along the way he tells you what it’s like to grow up in sixties Soho, go globetrotting with your best mates, to make a dead pigeon fly and cause an earthquake in Finsbury Park. Suggs is a singer, songwriter, DJ, actor and TV presenter. 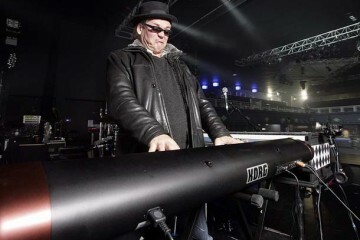 He is perhaps best known as lead singer with Madness, who have had 24 top-twenty hits and continue to tour. Suggs lives in Camden, London. – Features unseen and exclusive lyrics. “Oh dear. I’m alive..!” Pianist Louis Vause has always said that his albums are “Gouged out of him by circumstance” but his third album ‘Midnight In Havana’really is a case in point. Recorded as a valedictory set, a swansong if you like, after he was told that the onset of cancer meant that he had mere months to live, the completion of the work coincided with his liver transplant and the all clear. He was in the pink. The same could not be said for his credit cards which had covered Louis’ uncharacteristically cavalier spending on recording costs. Mark Adamson of the Deaf School Website gives us an exclusive quote or two from Suggs, on the forthcoming Deaf School Book. Deaf School – the story is told at last! 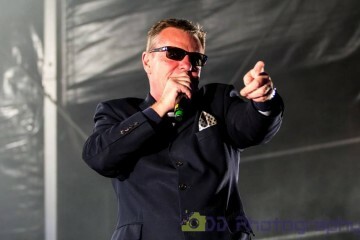 So writes Suggs in his foreword to a book, published this month amid a flurry of Deaf School gigs and other Book Launch events, charting the creation and career of a band that influenced so many artists that followed – and that still fills venues 40 years after their debut at the Liverpool School of Art Christmas Dance. Deaf School had a huge impact on Madness (Suggs: “Back in my youth I met some characters who were a right bunch, but what we had in common was that we loved Deaf School.”) – not least, of course, because guitarist Clive Langer’s became Madness producer and because Suggs married Deaf School singer Bette Bright! 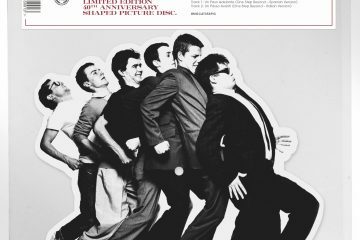 Written by leading rock music writer, author and broadcaster Paul du Noyer, a lifetime Deaf School fan, Deaf School: The Non-Stop Pop Art Punk Rock Party, is published later this month by the Liverpool University Press, priced at £14.99. Accompanying the publication of the book is a Deaf School exhibition, featuring original art works by band members, posters, photos, rare films of live performances, band stage costumes and much more. 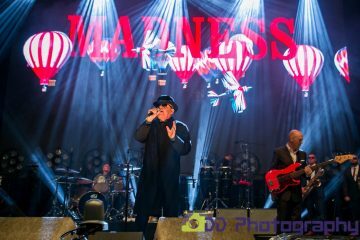 As most readers of MIS will know by now this year it’s the turn of Madness to be given the Specialized treatment in aid of the Teenage Cancer Trust and will see a raft of events all centred around the release of an album of cover versions of Madness songs that’s due for release in June. Previous years have seen both The Specials and The Beat as the focus – if you’ve not got either of the albums they’re both still available through Amazon/iTunes and monies raised still go to a very good cause. One of the activities that took off last year was a Specialized calendar in the style of Calendar Girls (and boys!!) and that is set to continue this year with efforts being led by Karen Le Cras, with the intent of making a Madness “themed” calendar to adorn your walls in 2015. For one of the months of the calendar, or even the cover, it’s been suggested to re-create the inner sleeve “passport photo” mosaic from One Step Beyond (yes, the one with the naked lady with the towel on her head in the middle!!). At a rough calculation this will require around 150 or more “fan” photos, and so we need you to submit a head and shoulders “passport photo” type shot – in keeping with the Calendar Girl’s theme it should be bare shouldered but anything else (hats, sunglasses etc) is fine. This is your chance to be part of an iconic Madness image and do your bit for charity at the same time (because of course you’ll want to buy one of the calendars too won’t you?!!). Of course putting together a calendar doesn’t come free – so any donations to help make it happen would be very gratefully received – these can be sent via PayPal to skasalesuk@gmail.com and should be clearly marked “SPECIALIZED CALENDAR” – every penny received will go towards publishing costs. To appear in the calendar we ask that you raise £50 sponsor money (businesses/friends/family) to cover the publishing costs and organise a location and a photographer (although the central team may be able to assist with putting you in contact with one). Gladness – Coming to a Supermarket Near You? Gladness, the Ale that thinks it’s a Lager, has found it’s way into a select crop of Tesco Supermarkets. 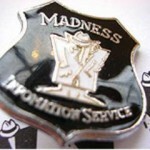 Madness are a bona fide national treasure. From the streets of Camden Town to performing on the roof of Buckingham Palace they are the archetypal pop group and ultimate singles band. When Top Of The Pops rocketed Suggs, Chas, Barzo, Woody, Chrissy, Thommo and Bedders into our living rooms with The Prince in 1979, the band became an institution almost overnight. Spearheading the 2Tone Ska revival, along with The Specials, Madness went on to have an almost uninterrupted run of 14 hits in the early 80s, totaling sales of over 6 million singles. In 1981, after a string of Top Ten singles and two smash hit albums, Madness took to the silver screen. Yet while a group nicknamed the Nutty Boys might have been expected to indulge in the knockabout japes of ’A Hard Day’s Night’ or ’Help!’ like The Beatles years before, ’Take It Or Leave It’ was a grittier, less glossy version of the events that led to them becoming one of Britain’s most cherished bands. 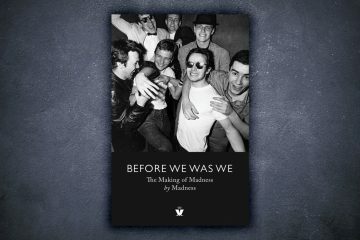 The autobiographical account of the band’s beginnings and rise to popularity, with the band members playing themselves, provides a brilliant snapshot of late 1970s London, as well as a virtual tour of the venues that Madness played as they rose to fame to become the biggest selling singles band of the 1980s in the UK. It is considered a must-see movie for Madness fans and music lovers alike. 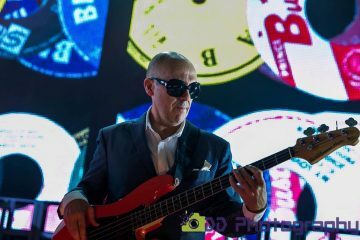 This unique screening, the first publicly in the capital for 33 years, is part of The London Intl Ska Festival. Madness related snippets from Facebook and Twitter. This week, MIS co-editor Rob Hazelby, goes back 5 years to issue 508, and the week of Sunday 25th January to Saturday 31st January 2009, and then back 10 years to issue 246 and the week of Sunday 25th January 2004 to Saturday 31st January 2004. 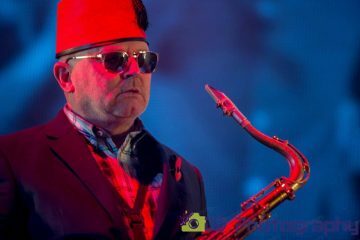 Wednesday evenings had been awfully quiet for the past few months, and it’d been like that ever since Madness fan Adam Nicholls lost his iTunes library. Quite what he was doing to lose all that we didn’t know. The important thing was that his precious music library had been restored, which meant that Nutty Radio was back, and for the last couple of Wednesday’s had been running from 9pm ’til around 11pm. On to ticket news, and the big announcement this week was that golden circle tickets had gone on sale for those willing to purchase their Madstock 5 tickets in advance. Little did fans realise until the day that this golden circle would segregate fans, meaning those without one of these special passes would have to stand miles back from the stage to see their favourite band. The band would be in for one packed couple of months if the above became officially confirmed! Remember Chris’ cupboard? With it being absent from the official site during the revamp, it seemed to many that it was no more. Thankfully the Madness Central team had been kind enough to give Chris and his cupboard a temporary home on their web forum and you were all encouraged to sign up and send in your questions. Well, what were you waiting for? Madness playing Glastonbury? Yes, this had become a yearly rumour so why should this year be any different? 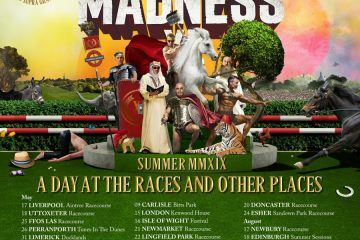 You’d have to blame this latest rumour on the fact that promotional articles at the Midem Trade Show were stating that Madness would be appearing on Sunday 28th June, the same day as blur were due to headline the Pyramid stage. With the rumours also starting to filter on to the eFestivals forums you had to wonder if that this could be more than mere whispers. We’d have to wait and see. Book news now, and an early press release in from Wavelength Films announced that Suggs would be releasing a book based around his recent TV series, Disappearing London. Priced at £18.99 for hardback and £12.99 for paperback, the book had a release date of August 20th. Time to get saving. We started this issue by putting the fears of a number of MIS subscribers to rest. We weren’t quite sure what they were doing, but for some reason the flash animation seen by the majority of visitors to the official web site wasn’t appearing, and all they were getting was a red screen. Thinking that something was up with the site they contacted us in the hope we could clear things up. Unfortunately all we could suggest was that they upgrade to the latest version of Flash and ensure they didn’t have a pop-up blocker running. Yep. We were useless! With the December tour now long gone, Jermaine of Tour Madness was now busy adding the latest batch of entries to his fantastic publication. Jermaine kindly gave us a sneak preview by giving us access to some of the new material which would eventually be finding its way into the next edition of his tour bible. Moving on, and co-editor Jonathan, gave us a heads-up on the latest Dave Gorman news. MIS Online had known about Dave Gorman sharing our great taste in music ever since we interviewed him about his comedy show “Reasons to be Cheerful” way back in MIS issue 120. Dave is a comedian, bestselling author and maybe one day he’ll be a novelist. At some point, probably during 2003 he reminded listeners of Northern Ireland’s Radio 1 Evening Session, how great Madness were when he chose Baggy Trousers as his favourite track of all time. One `lost` song that kept getting a mention every year or so on the various Madness forums was `Perfect Place`, a fantastic track that unfortunately never received an official release. For those who had never heard it, the Madness Trading Ring had uploaded a live recording (taken from The Red Wedge Tour, Jan 27th 1986, and featured on the bootleg “Nutty Sounds 2”) of the track for fans to download and listen to. 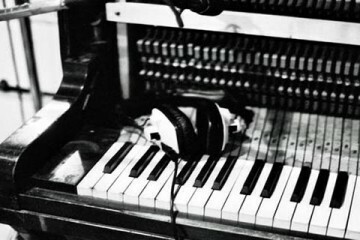 Little did we know that we’d have to wait a few more years to get our hands on the studio (demo) version. 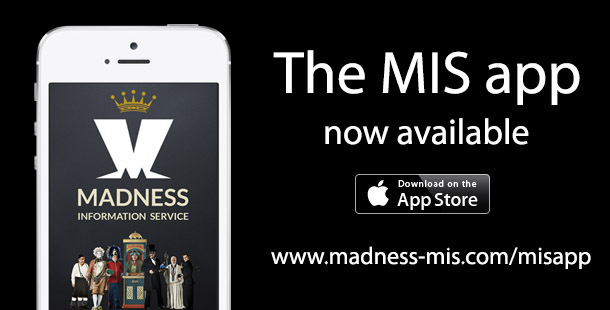 And finally, those of you with Apple devices, don’t forget to download and install the new MIS Online app. If you already have it installed please email in and let us know how you’re getting on with it, and any issues you’ve encountered and any suggestions for how it might be improved.